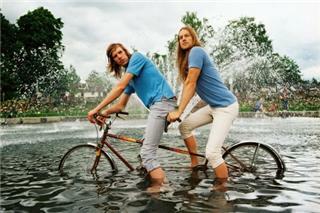 Menomena is an indie rock band from Portland, Oregon, United States made up of Justin Harris and Danny Seim. Both members of the band share singing duties and frequently swap instruments while recording. In concert, Seim plays drums while Harris swaps between a myriad of instruments. After giving away several different homemade demo CD-R recordings at local shows, Knopf, Harris, and Seim stuck with the DIY aesthetic of their early demos by recording their first album themselves. The result was their nine-song debut, I Am the Fun Blame Monster! (an anagram for "The First Menomena Album"), which was self-released on May 20, 2003. The album was elaborately packaged in an 80-page flipbook that Seim designed and individually hand-assembled while working at Kinko's. On November 8, 2005, Menomena released Under an Hour, an album of instrumental music written for and performed with Monster Squad, an experimental dance company based in Portland. The release consists of only three tracks, each of which is over seventeen minutes in length. Stylus Magazine gave the album a somewhat lukewarm "B-" and described it as, "an interesting view into a band that continues to evolve without really throwing down any breadcrumbs for them or us to follow." Menomena released their third album (and first via Barsuk Records) on January 23, 2007. As with their first two releases, Friend and Foe was entirely produced, recorded, and mixed by the band. It received relative critical acclaimwhile some websites such as Lost at Sea praised the album for its offbeat rhythmic structure and creative use of melody, others such as PopMatters criticized it for presenting a sense of feigned maturity. Pitchfork gave the album an 8.5/10 and again placed it in the "Best New Music" section, calling it, "The first great indie rock record of the new year." Danny Seim stated in an October 2008 interview that a new Menomena album was tentatively expected to debut in the beginning of 2009. "In a perfect world, we would have been done with a new record. Fall 08 would have been great. But then thats moved to January 09 we hadnt seen one another in awhile and were seeing each other for some European dates, and a festival date here and there. Were moving on a U2 time frame. ...We have a ton of material to use and we have to structure the stuff, pick up instruments and find songs. Id love to say January 09 but maybe I just like the way those words sound." Menomena spent most of 2009 in and out of the studio. A collection of pictures from these sessions were posted on their official Myspace, although no comments were made about the album's progress. In December, Pitchfork posted a video of Menomena playing a brand new track, "Queen Black Acid", in a hotel room, and in January Menomena stated, "We're finishing our new album in two weeks..." via Twitter. It was confirmed by Pitchfork on April 7, 2010, that Menomena's fourth full length album, Mines, would be released on July 26 in Europe via City Slang and July 27 in North America via Barsuk. A 7-inch split with The Helio Sequence would also be released on Record Store Day, with Menomena contributing the new track "Pilgrim's Progress". On June 6, 2012 Menomena announced their fifth album, Moms, which was released September 18, 2012. The album has been noted for its more personal lyrical themes, which address both members' relationships with their mothers.